Let's control 2-Wheeled Dolly and Camera Platform using Keigan Core app here. Download and use [2-Wheeled Robot]. Refer to How to use templates. Check how to operate it by reading the last part in the next section. This method is not using Templates. You just connect modules in [Edit] tab. Connect two KeiganMotors. Refer to How to connect. In [Edit] tab, double-tap an any square and select [2-Wheeled Car]from [Robot] tab. In the same way, select [XY Pad] from [Input] tab. Drag and drop [XY Pad] icon to [2-Wheeled Car] icon. [Binder] tab opens automatically. Tap to select [Drag Vector] and [Direction Vector] to connect binders. Operate 2-Wheeled Dolly in [Play] tab. If you do swipe action on square [XY Pad], the robot will go to the direction. Stop the motors to tap [free] icon. Go back to [Edit] tab and tap [2-Wheeled Car] icon, and enables parameters setting related to control. [Max Speed] is maximum movement speed and [Turning Ratio] adjusts how big it turn. You can input values directly to them. 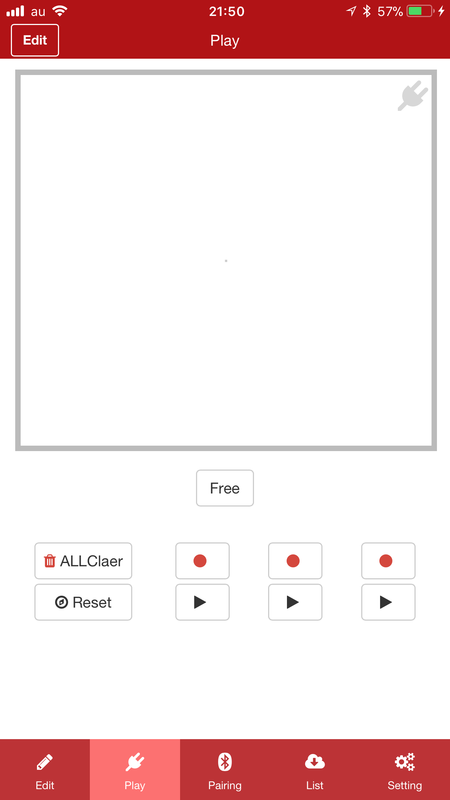 Download and use [2-Axis Gimbal] template. Refer to How to use templates. Try it by refering to [2-Axis Gimbal] template. Do swipe of flick action on square [XY Pad] in [Play] tab. Make sure that the gimbal moves on both of X-axis(Panning) and Y-axis(Tilting). Addition to it, you can record and playback positions by using red circle button. and black triangle buttons. 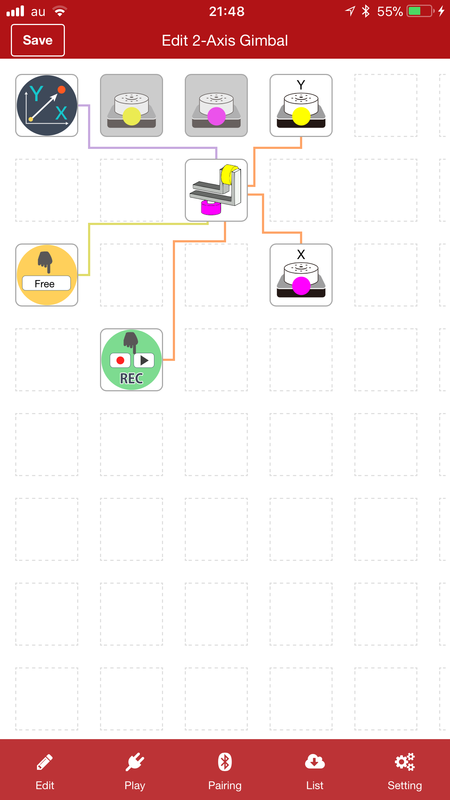 Go back to [Edit] tab and tap [2-Axis Gimbal] icon, and enables parameters setting related to control.